Welcome to the Hanama`ulu Town Celebration Website, which was created in 2004 for the two-day celebration in July 2005, maintained to publicize the one-day celebration in July 2006, updated to record the 2006 festivities, and maintained online these many years for all interested viewers to visit, and, hopefully, learn from and share with others. The website is one way for the community to gather, share and preserve the history of Hanama`ulu Town. The site was first published on the Web on July 13, 2004, and what an interesting journey the search for Hanama`ulu's past has been! Visiting the plantation camps through the recollections of those who once made their home in those little communities that dotted the plains of Hanama`ulu! Getting acquainted with the town's past residents through talk story with those who knew them! Learning about the landmarks that make this once-upon a-time plantation town unique! Every step of this journey has been a step of discovery and awe! Even now, in 2017, as we continue this unchartered journey of discovery, we have more dots to connect as we try to get a clearer picture of Hanama`ulu's past. Come with us on this journey of discovery and appreciation by visiting the website often. Remember Hanama`ulu's past and celebrate the town's present with us. Let us know what resonates with you. Let us know your hopes for Hanama`ulu. Embrace Hanama`ulu's future with us. 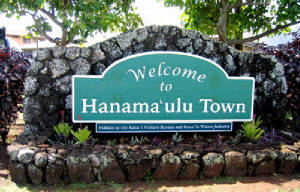 Share with us what you know about Hanama`ulu and the town's residents. We are only a keyboard away. To further advance the interests of Hanama`ulu, Hanama`ulu Neighborhood Association was organized, and the association website was published on Thursday, July 12, 2007. 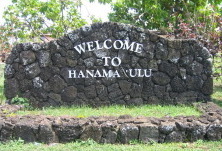 The name of the association was officially changed to Hanama`ulu Community Association at the membership meeting on Thursday, June 16, 2011. To access the site, CLICK the link below. Copyright 2004-2018. Poipu Web Designs. All Rights Reserved. without written permission of the Webmaster. To access HNA Website: CLICK the link below.